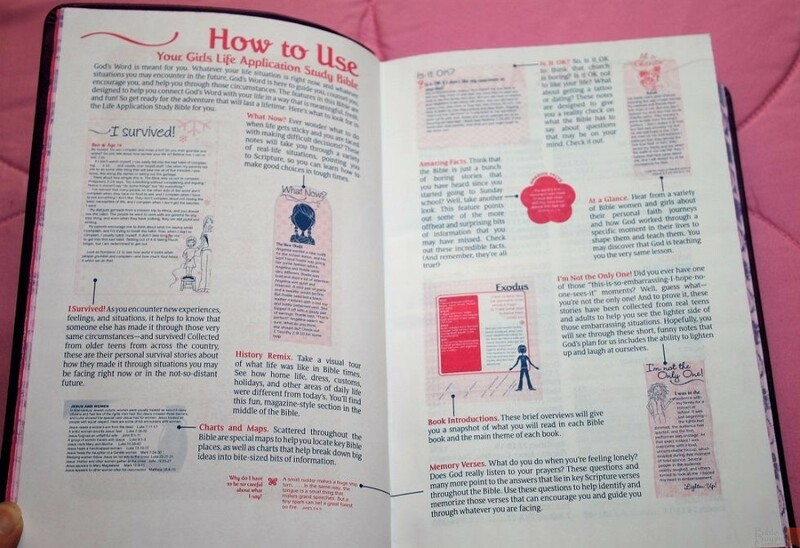 The Girl’s Life Application Study Bible is written specifically for tweens and teens and contains notes and advice on life. The Bible includes answers to tough questions about God, following Jesus, and loving others. 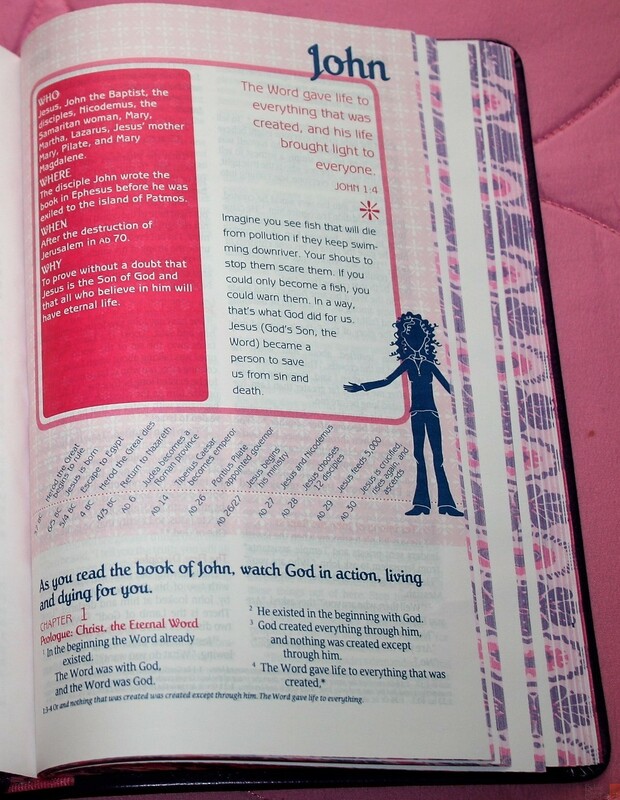 There are many articles and charts throughout the Bible that pertain to important topics for girls. The free review Bible I received from Tyndale is (roughly) 5.5 x 8.5 and is made from ‘leatherlike’ material. The style is ‘glittery grape butterfly’. 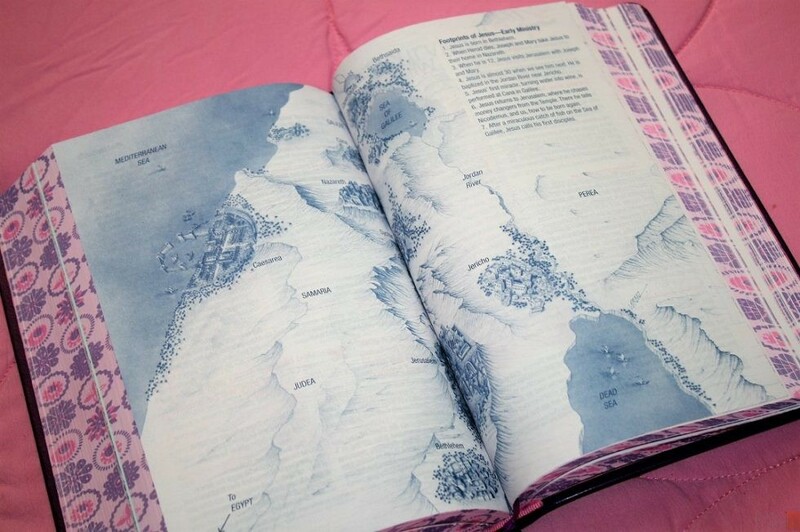 It has a very ‘girly’ purple and pink cover and the text has pink highlights throughout. The text is very easy to read. The paper seems to have a slight pink tint. It is not red-letter. I’m not sure, but it looks like maybe an 8 or 8.5 point font. It contains bold pink headings within the text, which are really nice. The New Living Translation is very readable. 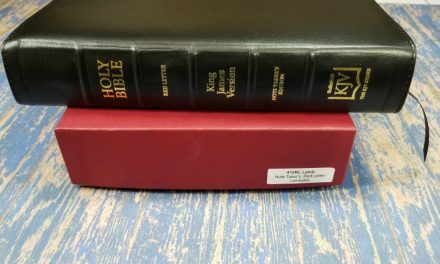 I would recommend the NLT more for reading than study because it is a ‘thought for thought’ translation rather than a ‘literal’ translation, but as a reading Bible the NLT is great and it serves the purpose and the audience of this Bible well. 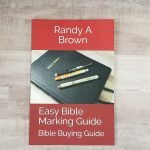 Features include a special presentation page, purple ribbon marker, designer page edges, memory verses, book introductions, timelines, charts, three-dimensional maps, and 16 pages of full-color illustrations about Biblical times. 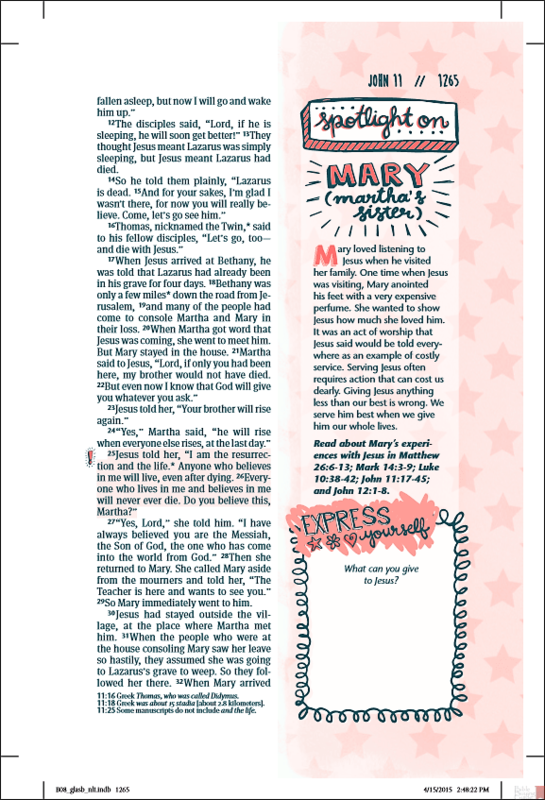 Other features include Amazing Facts, which are facts about the Bible, What Now?, which is real life situations with scriptures to help through difficult situations, I Survived!, which are personal stories of others that have endured tough situations, At a Glance, which are lessons about women in the Bible, and Is It OK?, which answers questions from a Biblical standpoint. The Amazing Facts are usually short facts based on a verse or passage. For example, the Amazing Fact in Acts chapter 2 states that the disciples were able to speak in many languages they had not learned by the power of the Holy Spirit. The facts inspire further reading and study. The articles from I Survived! give scriptures that apply to real life situations. They are very helpful to today’s girls because they will have a good Biblical basis and help build faith. There are several charts throughout that give important information. 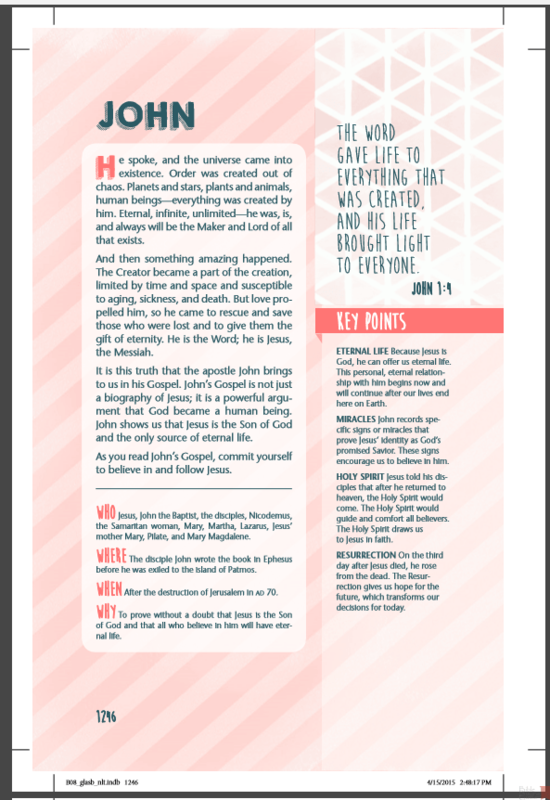 For example, there is a chart for the six days of creation that includes scriptures that coincide with the facts on the chart. Another chart gives reason to read the Psalms with verses for each point. The articles for Is It OK? have very good answers to tough questions. The answers are straightforward and to the point and include scripture to back them up. For example one question asks if it is OK to try out other religions. Another question asks about Ouija boards. Both answers include scriptures and a straight answer that is exactly what our tweens and teens need. 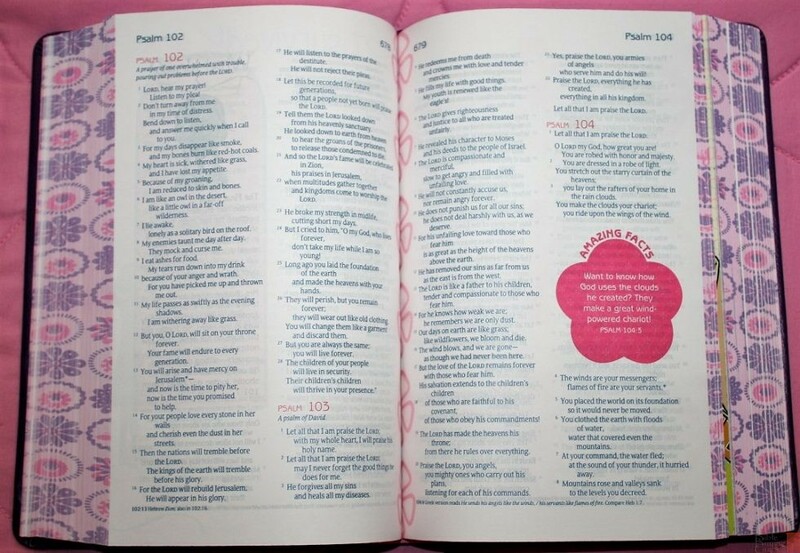 Overall, this is a very good Bible for today’s girls. I don’t always agree with the doctrines taught, but I do agree with most of the principles taught. 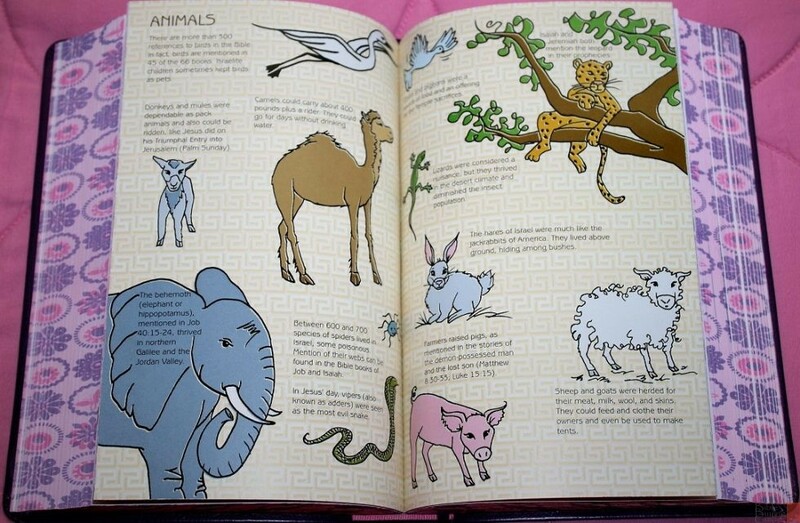 Judging by the response from my daughter as she opened this Bible, I would say it is very appealing to girls. 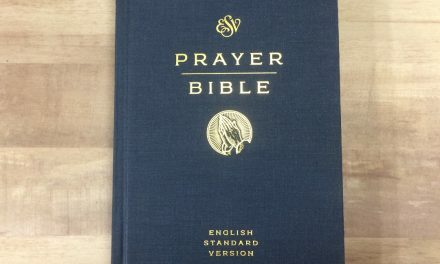 I recommend this Bible. Tyndale provided this Bible for free. I was not required to give a positive review- only an honest review. Though my daughter is now past the target age for this Bible she still enjoys reading it. 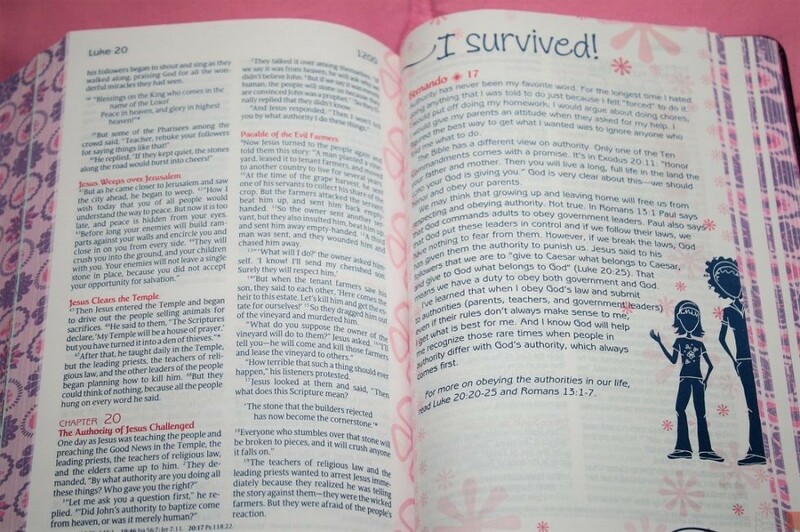 Her favorite feature has been the I Survived!, both for the real life stories and the additional references at the end that helps you find what the Bible has to say on the subject. 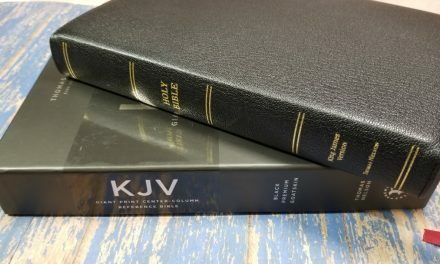 Tyndale has released a completely updated version of this Bible that is one of the nominees for the 2017 Christian Book Awards Bible of the Year. 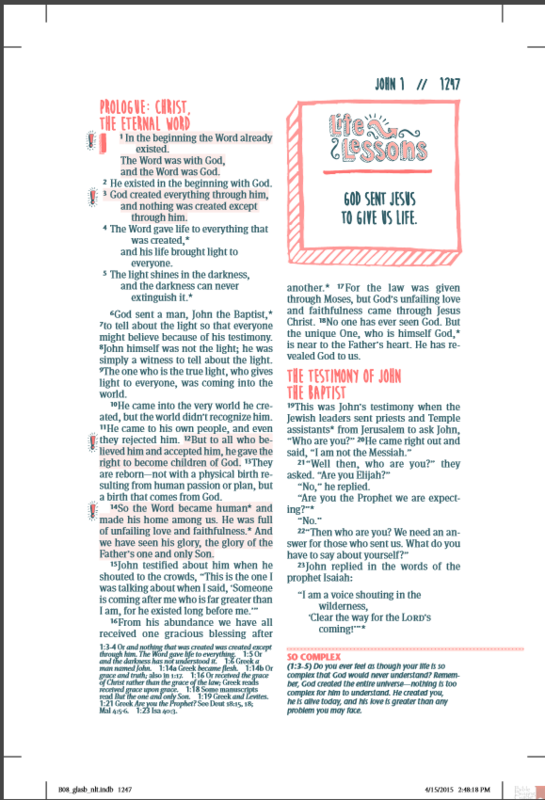 We haven’t had a chance to see it in person for more than a few minutes at the store but Tyndale has given us a PDF of the book of John to share with you. 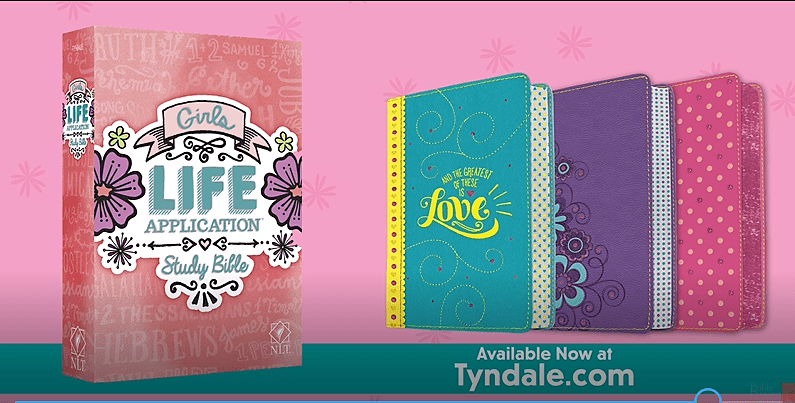 The new Girls Life Application Study Bible is currently available in hardcover, paperback, and both a purple and pink LeatherLike Cover, with the Teal and Yellow LeatherLike cover coming early in July. 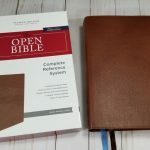 While trying to keep all the favorite features of the original Bible they’ve updated and expanded on some of them and added new features as well. They’ve added new Foundations for your Faith sections and separated the profiles of Biblical characters as Spotlight On with spaces after for girls to react called Express Yourself. The following photographs show the differences in the introductions to the Book of John. 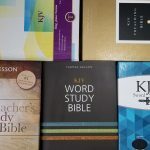 We love the NLT translation for readability (though we frequently reference more word for word translations while studying) and any features that encourage girls (or anyone) to spend more time with the word of God. 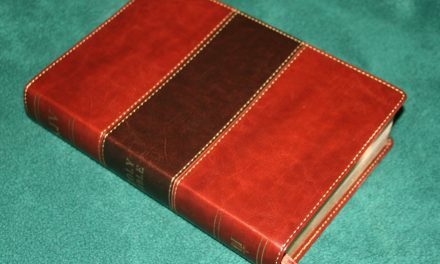 Study Bibles are very useful as long as you remember to make a difference between the notes and the actual Word of God. 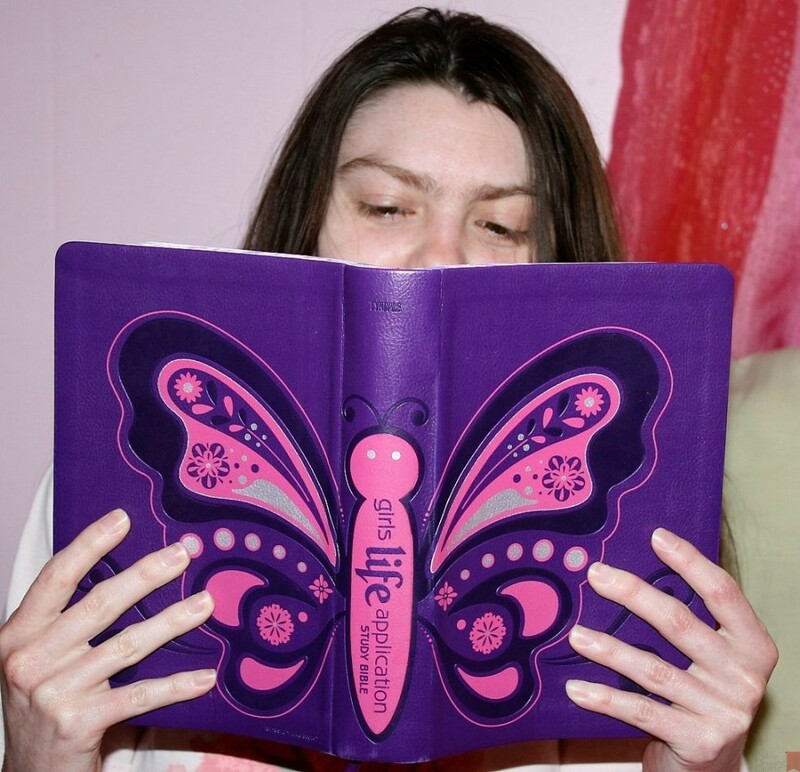 The new version of the Girls Life Application Study Bible seems to be a very appealing and informative update to the original.